Hi. 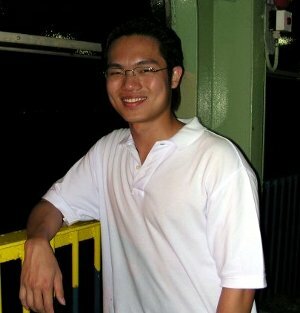 I'm Damien Ung, the 'brains' of this website. I started this website to collect and showcase the best prank ideas on the web for what they are - a demonstration of great wit and intelligence. After all, besides understanding humor, a successful prankster needs to understand how things work and have a developed ability to plan projects. Without these key components, a gag will quickly fail or degenerate into something stupid or dangerous - or both. My first prank ever was played on my older brother, when I was 5 years old. Big bro snored a lot in his sleep and mini me had access to my mum's mini-tape recorder. Just as 1+1=2, it occured to me that the most natural and funny thing to do was record him snoring in his sleep, then playing it back later to tease him. It was so funny at the time that even my mum laughed! Of course, things weren't so funny when he got back at me by putting his full weight on me. He was a lot bigger than I was at the time. A majority of my pranks were played throughout my schooling years right up to university. Among my favorites were chalking the class tables and lining a coin edge with pencil lead. Fast forward to today, I don't play as many pranks as I used to, but I still do enjoy a good practical joke every now and then. It's not so much because pranking is something to grow out of. In fact, it's mostly because I now prefer to play more complicated pranks that take time and planning to execute. I started this site with only 2 pages. As of April 2010 there are over 60 pages of content and the site is still growing! I've done my best to exclude these types of "pranks" and included only those that will even give the victim a laugh. Why call it a practical joke if you leave the joke out for some people? The only exceptions, of course, are the revenge pranks that are meant to protect yourself and even the score with a bully. The bully won't find it so funny. With that said, feel free to contact me if you have a great prank story or idea to share. You can do this via the "Contact Me" button on the left. Remember, the best ideas are born in your own unique situation and don't quite apply to many other people. I'm looking forward to hear from you.